To be honest, it’s not a real souffle, but it does have a light and airy mouth feel similar to its namesake. It’s also sweet, colorful, packed with vitamins and –most importantly– flavor. But if you do love sweet sides, run to the store (or, is your local the farmers’ market open yet?) and stock up on ingredients. It’s that good. Preheat oven to 350-degrees F. Grease a 2-quart baking dish or a 10-inch pie plate; set aside. Boil carrots for 15 minutes or until very tender; drain. 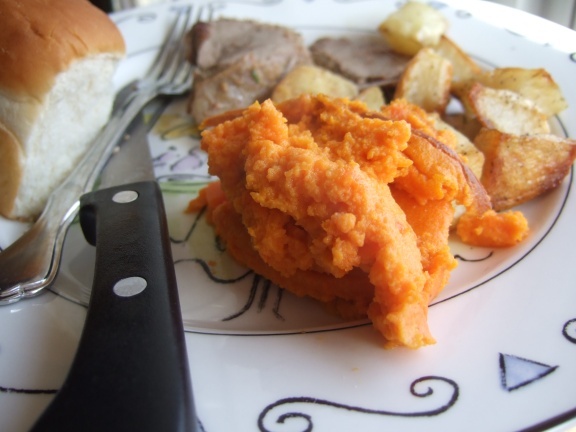 Place carrots in a food processor and process until smooth. Add the rest of the ingredients and pulse to combine. Spoon mixture into prepared dish and bake for 40 minutes or until puffed and set. Serve warm.